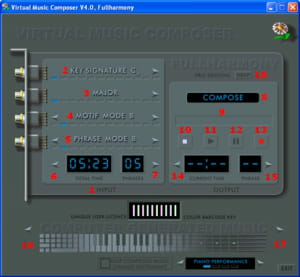 Virtual Music Composer is program that is mainly designed to compose music using computer. It is easy to use and does not require any specific knowledge in music composing. Composing: the main function of the software is to create music of various styles such as jazz, blues or even Arabic style. In addition to that, it is integrated with a virtual keyboard that is synchronized with the computer keyboard keys. Preview option: the advantage with Virtual Music Composer is that it also provides all users a tool for previewing the composition in real time so as to correct potential mistakes. It includes simple but useful items such as play, save and record button. Input: with this option, the user is able to define the key signature among the proposed one. He can also choose the genre such as Hungarian or Harmonic. The phrase mode can be as well predefined. Multifunction: Virtual Music Composer is not limited to musical creation; it can also carry out sampling, sequencing, and audio recording. Several predefined parameters can be modified to obtain a record of good quality. With the full version, the user can choose to perform whether with piano or guitar. Virtual Music Composer has an option to predefine the total time of the new composition. Latest update on February 19, 2015 at 08:44 AM.